I made my Cake and I'll wear it too!! "A Pavlova is a meringue cake with a light, delicate, crisp crust and a soft sweet marshmallow center." I'll take two please! I had no clue Pavlova was a cake until I did a Google search for the pattern and all these pictures of cake popped up instead. It then dawned on me what an idiot I am. I was wondering how they came up with such a fun name for their pattern. Twirling around the house saying Pavlova 100 different ways had become a way for me to entertain Vito. Why can't I think up any cool words?! And now after finishing my Pavlova wrap top I see how the cake and top relate. I am just a big ol' pile of sweet marshmallow goo when you unwrap me. bahaha! I downloaded the top only from Craftsy. The pattern purchased from Steph's Etsy site comes with a circle skirt as well. My fabric is from Joann's, a pink polka dot reversible knit. The other side is striped. This is a fairly quick make and the best part, I made absolutely no alterations or fit adjustments! That's a first! I did learn a couple of new techniques, the lapped neck seam and using steam a seam to finish the edges. Oh steam a seam where have you been all my life?? pants or skirts...or you can just let it all hang out like me. So wait it's not over yet..I have a complete outfit to show ya'll! I also made a skirt using another Simplicity Amazing fit pattern. I have to say this skirt's fit came out more amazing the first time than did my red hotpants. Learning from that I cut a size smaller than what I did with the pants. Fit turned out a lot better. Pattern: Simplicity Amazing Fit 1717 Joann's 99 cent sale! Alterations: None other than slightly tapering in at the sides starting from the top of the pockets. I thought it looked a little wide on me towards the bottom...Do you think? Likes: I love the front pockets. It was also a quick make. Dislikes: I think the instructions were missing a few steps when it came to attaching the yoke. I wish I would of lengthened it about an inch. 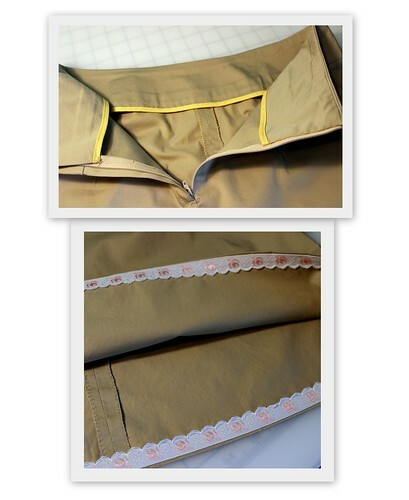 I like my skirts to hit right above my knees so I was only able to fold up the bottom hem 1/4 inch and finished with some fancy trim from my stash. I also used my newly found steam a seam to help me accomplished this. Oh yeah and I finished the yoke edges with some bias tape from my stash as well. One thing that really bums me out about this skirt is that after I washed and dried it the yoke got all wrinkley. I don't know why this happened. I used a woven interfacing like I always do. I guess the cotton sateen and interface just don't jive. Anyone ever have this problem? It's not so noticeable after I iron the crap out of it. I can always wear a belt to try and cover it up or just wear a shirt over it...no fun. Beware..gut shot and some pasty legs ahead, sunglasses recommended. Before you leave be sure to take a look at my Bobbin List page. Often, like right after finishing this outfit, I become quite confused at what I want to make next. A lot of times I have plans but see other things along the way that I end up going and buying fabric and patterns for. I've managed to accumulate so much that I've forgotten what fabric I paired with what pattern or I don't know what to make next. I decided to photograph all my fabric and pair it with a pattern and put it in order of importance (not that it's not all #1 important!). As I complete I will delete it from the list and add it to My Makes page which also needs a huge overhaul. I'm hoping this list keeps me on track. I will continue to update it and add to often so keep checking back. I've got a lot more fabric to photograph and pair up with patterns. If you think this is a good idea and would be helpful well then why not make your own "Bobbin List"?!. Cute top! I just tried my first amazing fit pattern and really liked it. Your skirt is great..I'm not sure why interfacing goes like that after a wash sometimes, I had it happen once too. Yours still looks fine though. This is far too cute in the pink polka dot! I love it!!!! Very cute! I love the color and polka dots! Such a lovely outfit. I do like the wrap top especially. You need to eat a pavlova... if you wondered where steam a seam has been all your life, you've been seriously missing out being pavlova-less too!!! Cute outfit! I really like the Pavlova top. Bright pink and polka dots are perfect for you. :) The fit of your skirt looks great, too. I just love that material, it looks so good with the top pattern that you have chosen! Ooh, pretty pretty! Pink polka dots! :D Two makes in one blog post... nicely done! Both outfits are gorgeous. Your skirt looks soo well made!! The top is just too cute the colour really pops, love it! What a cute outfit! Everything is very flattering and looks great. I want to see the stripes on the reverse of your knit. These colours suit you so well and your pavlova is really gorgeous! You need to get out and try the other type of pavlova too, you're seriously missing out! Thank you! A lot of people have said I'm missing out , I need to find some to try!! Thanks! If I was good enough I would of found a way to make it a reversible wrap top. Now that would of been cool! I wondered that too. I'll have to try some different interfacing. Thanks!! Thank you!! Two makes is rare for me! I love the way you styled the entire outfit! The top is adorable! Thanks so much! I really love this pattern. The first time I've ever made a top that fit perfectly with no fussy alterations. I got so many compliments on it as well. 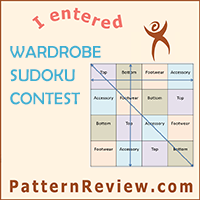 I'm definitely going to give some of your other lovely patterns a go! Grainline Scout Tee...I made it twice!